Arctic Cold Climate Heat Pumps are specifically designed to work in temperatures below freezing as low as -25C (-15F). Few people realize that the air below freezing has nearly the same amount of relative energy as it does above freezing. By understanding the concept that air contains energy, we can then begin to understand how a cold climate heat pump can work. Only in space where the temperature is -273 C (absolute zero) is there no energy left in the air. This is the next principle used in a heat pump. Warm air has more energy and more molecules colliding compared to cold air and will naturally migrate to cold air until an equilibrium is established. So, using a colder liquid such as Freon, which does not freeze until -50 we can cause the WARMER -25 C air to transfer its energy to the colder Freon inside the heat pump. Different substances have different boiling points, and this can be changed by adding or removing pressure. Water boils at 100 C at 14.69 Psi (sea level). However, as we reduce the pressure it boils sooner. On Mount Everest with a pressure of only 4.89 psi water boils at about 71 C. This is because it is under less pressure. The refrigeration cycle uses Freon, which transitions from a liquid to a gas at a much lower (colder) temperature compared to water. By adjusting the pressure of Freon, we can manipulate when this phase change occurs. Our heat pumps use a refrigerant called R410a which more suitable for storing energy in colder conditions. The temperature of this refrigerant can be made to boil at as cold as -50 C by reducing the pressure inside the heat pump. The cold -50 Freon passes through a heat exchanger and the warmer energy of the outside air (-25 C) naturally moves to the colder Freon across the heat exchanger. This causes the Freon to absorb the energy. 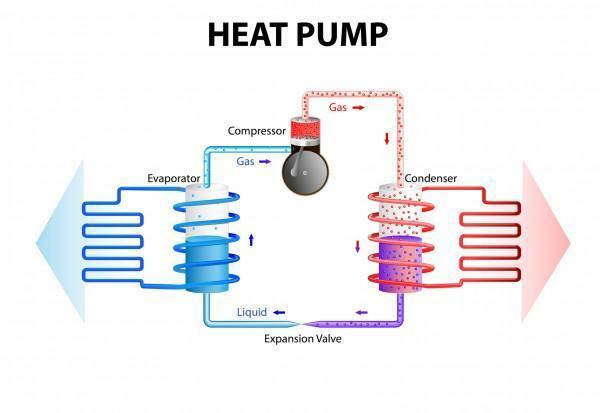 As it heats up the Freon starts to evaporate (boil) and turns into a gas, The Freon gas is then brought to a compressor where it is compressed, causing it to greatly increase in temperature as its volume deceases. This hot gas is then transferred over another heat exchanger in which the other side is colder water/glycol and the energy again transitions from hot to cold and heats a water/glycol loop in the home. The refrigerant loses its heat, causing it to cool back to a liquid to begin the cycle again. That is the basics of the refrigeration cycle. If you understand these basic principles, then you can get a grasp on how a heat pump works even in -25 C (-15 F). A heat pump is simply a means of transferring energy from one source to another. It is the same principle used in a geothermal heat which pulls the warmer energy out of the ground and delivers it to the house through a series of heat exchange processes.